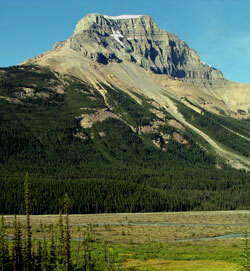 Mount Amery is one of the outstanding peaks that may be readily viewed from the Icefield Parkway. 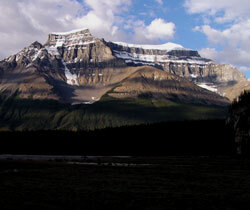 From the northern end of the gravel flats near the Alexandra River, the glacier topped, massive horizontal strata of the northern face are most impressive. Leopold Amery was born in Britain and was a journalist with the London Times before beginning a career as a politician, serving in the British Parliament for thirty-four years. In the latter years of his career he played a role in bringing down the Chamberlain Government during the darkest days of World War II. In the great parliamentary debate of May 7, 1940, addressing Chamberlain from the government benches, he quoted Cromwell?s words, "Depart, I say, and let us have done with you. In the name of God, go!" Chamberlain resigned thus opening the way for Winston Churchill, Amery's friend from schooldays at Harrow, to become the wartime prime minister. Amery had visited the Canadian Rockies in 1909 but, "it was not until a disagreement with the electorate in the spring of 1929 released me from the cares of office that I felt that I was justly entitled to a real holiday." He had a special motive for this visit however since the Geographical Board of Canada had recently named a mountain in his honour. As a parliamentarian, Amery had promoted trade reforms with Canada and worked towards advancing the constitutional arrangements with former British colonies and the Canadian government of the day must have had great respect for him. "To me the challenge (of making the first ascent at the age of 56) was obvious as well as "proving myself as a mountaineer and not merely as a politician justified of the appellation." Amery was joined by Brian Meridith, a skier and Canadian Pacific Railway public relations officer and they were guided by Edward Feuz jr. Arthur Wheeler accompanied the expedition but did not participate in the climb. A route was difficult to locate up the steep cliffs which were quite "rotten" and broke away easily. Unfortunately, the weather did not co-operate either and deteriorated to the point that Feuz suggested turning back. Amery insisted that they press on, writing later that when they reached the summit, "Here we felt the full force of the blizzard and were more than once hard put to it to keep our feet...I had made good my claim to Mount Amery in the mountaineering sense. The view I had to forgo." The party had to spend the night on the mountain while descending. Amery was most pleased with his climb and Edward Feuz must have been too. The guides took great pride in getting someone famous to the top of "their" mountain. The following evening Amery asked, "Well, you know Edward, when we got onto my mountain, it bothered me a little; this bad weather we had and I was worried we weren?t quite on the top." Feuz replied, "We'll fix that! 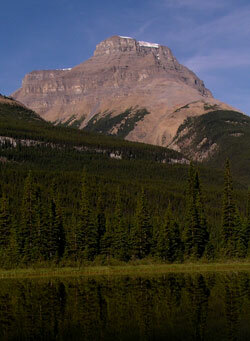 Let's climb Mount Saskatchewan. It's right opposite your peak, just across the valley." I'll show you the stoneman." Upon reaching the summit the following day Feuz said, "Now sit down here. Here is the glass. Look right across." Amery took the glass and smiled, saying, "You're right Edward, its right on the very top." 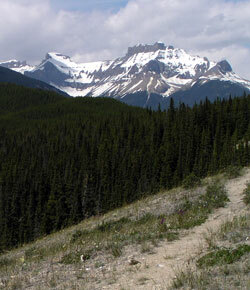 Edward Feuz jr's complete story of the first ascent of Mount Amery may be found in "Tales from the Canadian Rockies" by Brian Patton.